I find this concept increasingly important to both deepen commitment to realizing the rights called for in the Universal Declaration of Human Rights (UDHR), and to recognizing how vitally important each person is to this process. The UDHR provides an aspirational framework adopted by the members of the UN General Assembly on December 10, 1948, defining what constitutes human rights for all people. While it is important to learn about the UDHR and its historical context of seeking to eliminate the oppressions and horrors associated with World Wars I and II, I believe it is vital that we consider our sense of obligation /responsibility to be part of making the words of the UDHR a reality for ourselves and others. Seeing ourselves as part of this process gives relevance to the continuing influence of the UDHR as a framework for positive action, where we can identify the gaps that must be addressed to get from the current reality to the rights called for. 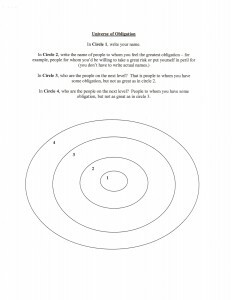 Here is a link to the outline and activity we present to learn more about the Universe of Obligation. As you’ll see, the concept relates to the bystander, one who is present, yet not taking part in a situation that is occurring, yet could take action that would address a wrong or make a positive difference in another way. Questions are posed to spur conversation about the ramifications of being a bystander. 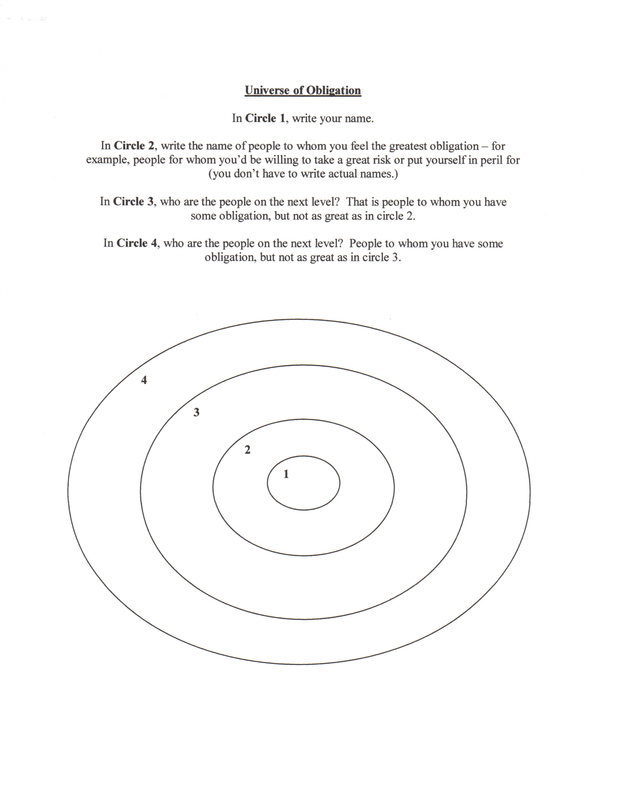 The activity on the second page provides a way of depicting ourselves at the center, with the circles extending beyond as representing the people to whom we have a sense of responsibility, for whom we would take the risk of speaking out and/or taking action. I have been worried for quite a while now that the day-in-day-out news of seemingly overwhelming threats, whether the instability in the Middle East or the fires destroying vast areas of treasured land and dwellings, generates a sense of hopelessness and futility… “Why should I bother to vote, or what can I do to make any difference?” I was fortunate to be inspired at a young age by people who were part of the marches in the South that helped further civil rights, economic, political and social justice, and, as a result, believed that I ought to act, and that I could do something to make a difference. I believe that we are on a continuum of struggles, dating back to the beginning of time, where people with the “courage to care” have spoken up and taken actions, small and large, to right wrongs and enhance the well-being of people close to them and in far distance places. I hope that this idea of the Universe of Obligation spurs renewed thinking about how we are part of the greater world around us and that our individual actions matter.